As you may have heard, we at Skimo Co are fans of the light ‘n fast method and enjoy gear that enables efficient travel through the mountains. Manufacturers are constantly innovating and streamlining, but Katadyn just considerably upped the ante. The Micropur MP1 tablets are not only one of the lightest ways to gain access to the other 71% of Earth, but also one of the easiest ways to purify water. 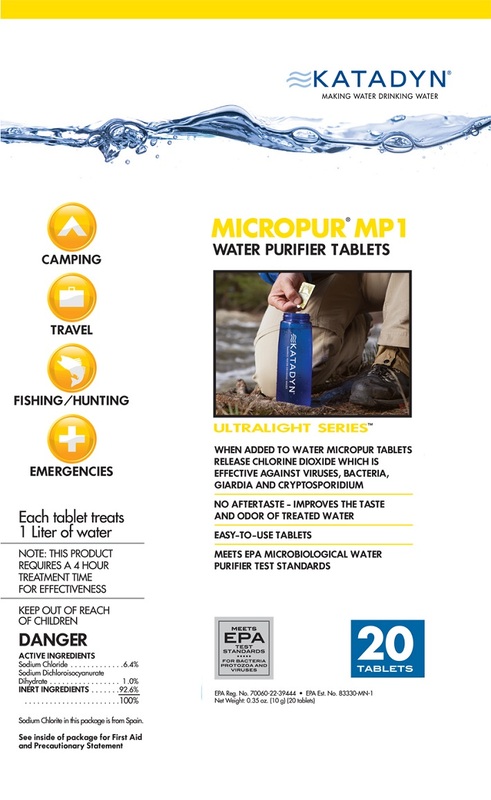 As if it couldn’t get any better, the Micropur is the only EPA approved water purification tablets and comes in a pack of 20. Looking for an ambitious stand-alone water treatment solution or a great addition to your emergency kit? The Micropur will be there for you, Giardia, bacteria, viruses, and countless other contaminants. So powerful it will purify liquid dihydrogen-monoxide in its tracks. Unlike other purification tablets, the Micropur is tasteless and odorless after treatment. One tablet treats a liter of water. For emergency use or quick use on tours, these are hard to beat. We use on the way up to huts and when on long trail runs, as a few grams for these saves pounds of water. Not 100% sure if these are to blame, but may slightly discolor some flasks and bottles. Little taste leftover. I've been relying on these for many (many) years (nearly two decades by now) for all my spring & summer ski tours (plus my occasional camping or hut-based overnights). Typically I start off on an all-day (and then some...) tour with just a medium-sized externally carried water bottle (e.g., CAMP Action Bottle) then rely on quick refills and water treatment throughout the tour. - The packaging is hard to open by hand, so before I take them into the field, I cut a tiny slit into the side of each individual packet. - You don't want to ingest this stuff (chlorine dioxide) before it's dissolved in water, so bring your packets in a snack-size ziploc bag to prevent any residue from opened packets from contaminating whatever gels, bars, lip balm you might be carrying in the pocket. - The official treatment times are based (by U.S. EPA regulations) upon the worst possible combination of water quality and temperature. But unless you're trying to treat yak-polluted water, half-an-hour kills everything, including cryptosporidium and giardia. - I don't notice the taste in the field, but if I would notice something (despite the product's claim to the contrary) in a side-by-side comparison with tap water, although it's a very mild effect.